This NEW Airport hostel is perfectly placed for travellers arriving or departing Iceland by air. 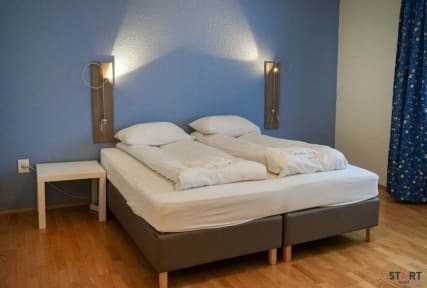 Located right by the airport and only 8 km by road (8 min drive) from the International Terminal at Keflavik Airport, it provides the perfect setting for first and last night on your Iceland visit. This quality hostel is designed and built to meet the needs of the hosteller / traveller that is seeking clean, comfortable and spacious facilities with modern comforts including private bathroom and toilet facilities in every room. The option of self service is available through spacious and well equipped self-service kitchen and washing facilities. Breakfast service is provided at no additoinal cost and a „Micro Kiosk“ is available within the facility. Our staff is devoted to assisting guest with their travel planning, providing information and further reservations if needed. 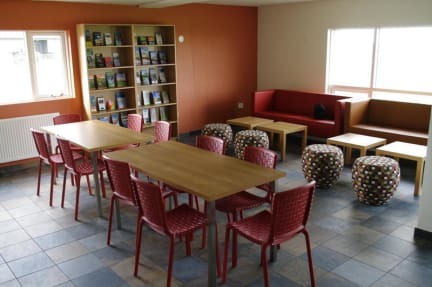 The Start hostel is designed to host individual hostelers, families and groups alike. Large family rooms meet the needs of families traveling with children and individuals can choose between room types from ensuite double rooms to 4-5 bed dorms. The hostel is open 24 hours. Check in is any time after 14:00. Check out is before 11:00. Early Check in or late Check out can be requested. This hostel was amazing. My friend and I did a 2 week bike tour through Iceland, and there were a lot of logistical things that came up despite us being as prepared as possible. The staff here couldn't have been more helpful! They knew a bike shop in town where we could get some last minute supplies. They let us use their computer for HOURS re-planning parts of our route when weather made is necessary to change our plans. Thank you so much for helping make our trip a success! My friend and I really enjoyed our stay here even though it was just for a few hours of sleep. The mattress was very comfortable, room was spacious with the other dorm beds, and the k staff were very helpful and friendly. Also super clean which was important for us! Very pleased with Start Hostel. Had booked a four person dorm room and had the room to myself. Was quiet, clean, and staff were very friendly. Scored lower on location, just because it isn’t great if you are spending anymore than a night there. No fault of the hostel though. Would reccomend to anyone who has an extended layover in Iceland. This has been the best hostel I've experienced thus far. While the location isn't great if one intends to see Reykjavik, it is great if you just happen to have a long layover and need somewhere to take a shower and sleep a bit. The hostel is extremely clean - including the bathroom - the dorms are really comfortable and spacious so you don't feel like you're on top of the other people, and the staff is really friendly and welcoming. The breakfast was also great. Highly recommended! There is no transportation transportation options to the Blue Lagoon from here, which is why I chose to stay here - I had to rent a car; my other option was a bus to the airport to get a shuttle from there, or taxi. However, this is my fault for not looking into it further and I don't hold it against the hostel - just including it for information purposes. Kind of in the middle of no where but convenient to the airport if you have a car. Very clean with great facilities. Staff was helpful. Great staff. Comfortable bed and new facilities. Close to airport but still need a taxi (reserve ahead of time) to get to the departures/arrivals terminal. The included European breakfast is pretty good and partially makes up for the high cost, so don’t miss breakfast! Great for a stopover not much to do in the area but they do have a great pool in town if you have the time. Proximity to the airport was nice. Not close to any activity outside the hostel, so don’t expect much. Breakfast was nice to have included.